When the Coach arrived at Charlotte Square, I was pleased to see Scott the Guide & Steven the driver again. We headed of to our first destination, which was Linlithgow Palace. We were the first visitors there before they opened there door, which was pretty cool as it was just us for a while. Had a look around the grounds and took some picture but I did not take the chance of going up the tower as there where 139 steps maybe if I didn’t have sight loss, i would be straight up there looking at the view. After being at Linlithgow Palace we headed of to see the kelpies, this was great to come back and see them, got a few photos. It was funny a little as Scott the Guide lay down flat on the ground and took a picture of me with one of the kelpies hehe, awww thanks for doing that Scott. Up next was Stirling Castle, one of the places I’ve tick of my list as I wanted to visit. Very impressive looking around and doing some learning, the views were great, just a shame the weather was a bit dull. Here we are at The National Wallace Monument, we could not get the trailer up the hill as they were doing some wo so we walked half way up before getting a lift. The views was amazing from the viewing platform but I was not going to attempt to climb up 246 steps to the top of the monument hehe. 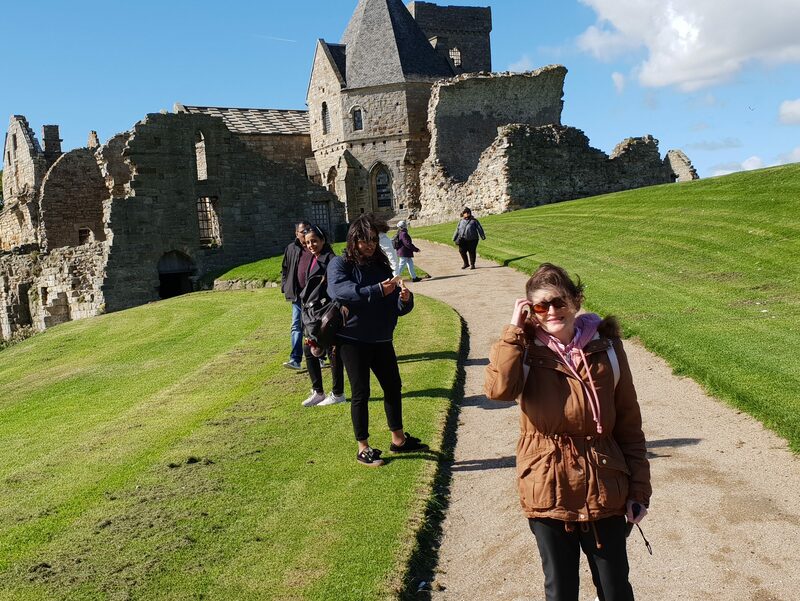 The overall of the Tour trip with Lothian was outstanding, I didn’t expect to do so many things but I enjoyed every minute of it from start to finish. A massive thankyou to our Guide Scott & our driver Steven for taking good care of us all and showing us a really good time experience. I can’t believe I’ve done my 5th day tour with Lothian, really fantastic and well recommended to see the wonderdul experience for yourselves with the outstanding team that will go that extra mile to take good care of there passengers.